Whilst I was researching on cloth diapering, I came across this Charlie’s Soap on many of the cloth diapering sites. Almost all of them recommended Charlie’s Soap (along with Bac-Out) to get the poop out but was also Hypoallergenic enough to use against baby’s tender skin. The best part is that it is uber affordable. 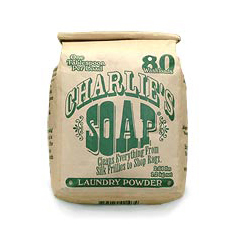 3lb bag of Charlie’s Soap has 80 load capacity. I also like to put some in a squirt bottle and mix it with warm water. Let it dissolve and spray out the oopsies. It has fresh natural scent that has no fragrance. This coconut-based detergents with Green River washing soda is truly an Eco-friendly gem. We have used and enjoyed miracle II soaps for some years now. And until recently, praised it left and right… Then Clayton died and the soap acquired a scent that really is disappointing. So disappointing that we are looking for a substitute… and as you may imagine we are having a hard time finding a soap for washing everything with no after-film or scent. We would love any ideas you may have..please reply. In regards to using Charlie’s soap..I have heard not to use soap on cloth diapers because it will eventually have a waxy “build up” that will affect the absorbency of the cloth diaper. 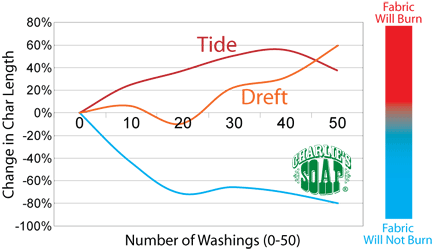 Dreft or Ivory was recommended because it is a detergent. What are your thoughts?